Dulux Trade Anti-Graffiti Paint Finish is part 3 of a complete 3 part system comprising of a sealer, primer and finish. It is a high performance water-based paint that is resistant to repeated washing, steam cleaning and solvent cleaning. For use on sound previously painted surfaces, or after sealer on bare concrete. Ensure that surfaces are completely clean and thoroughly free from grease and oil. 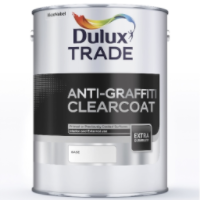 Apply 1 coat of Dulux Trade Anti-Graffiti Sealer (only required for new work), followed by 1 coat of Dulux Trade Anti-Graffiti Primer and 2 coats of Dulux Trade Anti-Graffiti Finish.